Ongoing brevity offered designer Susannah Henry and choreographer Amy Voris the opportunity to investigate the intersection of their practices via the use of materials and spontaneous action. Choreographer Amy Voris and scenographer Susannah Henry will investigate a collaborative working process with an equal dialogue between movement and design. Amy will work with simple and concise movement while Susannah will work with coloured electrical tape to “draw” in the space. We intend to create chains of material which alternate sparse action with re-configurations of tape. A line of tape possesses clarity, suggests permanence and can also be neatly and quickly removed. This double nature of the material lends itself to the rapid turnover of design, enabling spatial intervention to be as ephemeral as movement. Electrical tape is colourful, sticky, rubbery, absurd and vividly two dimensional next to a moving human body. Using simple line and shape to define the space for human action reduces and concentrates Susannah’s practice as a theatre designer. Limiting movement to a brief, discrete action refreshes perspective on the body: its eloquent form and innate expressivity. There is so much to notice in the action of bowing the head, opening the mouth, shifting forward, sticking out the ribs. In a single moving image there is a whole world of sensation, association, reference. Working with simple and spontaneous action reduces and concentrates Amy’s practice as a choreographer / performer. 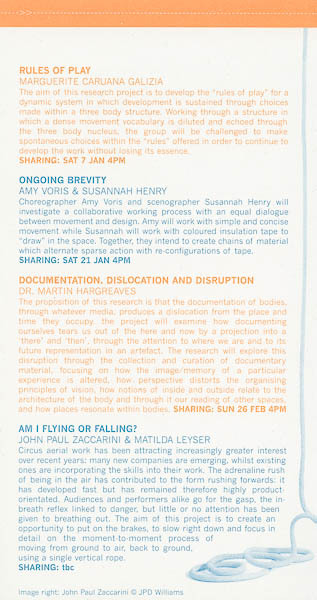 We are also curious how Susannah’s functional movement will sit next to Amy’s more abstract sampling and stillness. Our process will be improvisation-led and will warm towards the use of association. To begin with, we will adhere to alternating our contributions to the unfolding series (perhaps even using strict time or action limits). Each part of the chain will rely upon its predecessor. We are attracted to this rule / limitation as a means of coaching equal contribution and as a means of encouraging non-attachment to material. We imagine the initial strictness of the alternation to feel liberating through the prolific chains it enables and through the relinquishment of responsibility. We also imagine relaxing these rules when we want to. We wish to simplify and to refresh what we do. We wish to emphasise a process of discovery, to encourage non-attachment and to quieten internal judgment. We wish to deepen our collaborative relationship and to de-centre authorship. We have worked together during the past year on the realisation of a dancework (Hover) and on a series of movement / space workshops for Amy’s student group and have been awe-struck by moments of discovery. We believe there to be tremendous value in these moments of emergence and shared conversation. This project will allow us to look with some sensitivity at the ways in which we might develop ideas prior to embarking on a new work. 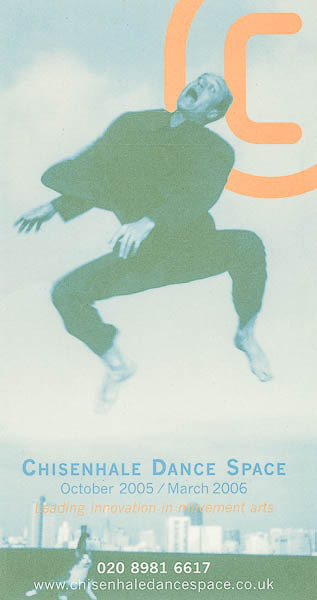 Often the designer operates on the periphery of choreography, designing around rather than through the work. We would like our next project to be developed / led by both of us. For Susannah this project would, unusually, afford time to consider her instincts in terms of visual design. Metaphor. We imagine that our improvisations will realise a kind of impermanence. Bold unwavering lines are also instantly removable. Boundaries and events are both meaningful and transient. a warm-up or preparation for something else? how does strength reside in vulnerability? and what are the consequences when that commitment changes? how does my internal quality of performance contribute to the properties of the work? is this activity an invitation for a durational event?